(Targeted) Earn LOTS of Bonus Airlines Miles With This Rental Car Deal! Plan on renting a car in the next few months? Good news! 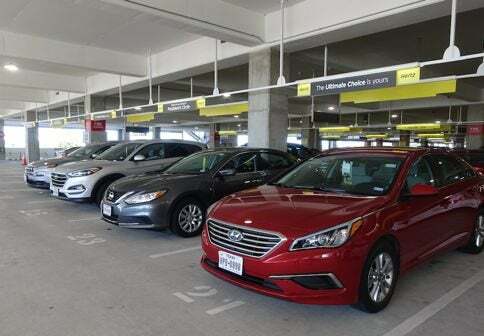 Via Reddit and Miles to Memories, some folks have been targeted to earn up to 5,250 bonus United Airlines miles on their next car rental with Hertz! So check your email and spam folder to see if you qualify. Book Your Car Rental Through United.com and Earn Bonus Airline Miles! I’ll share the details of this offer, and how you can make the most of the deal. 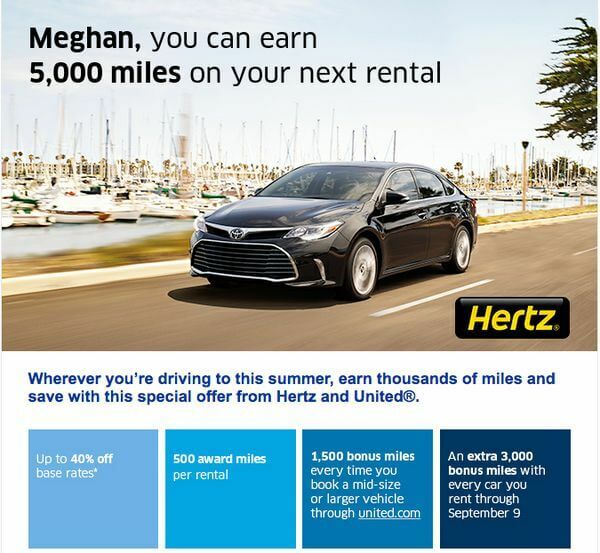 If you were targeted, you can earn up to 5,250 bonus United Airlines miles on your next Hertz car rental. But some folks have reported only being targeted for 2,000 bonus United Airlines miles. To qualify, you must book your rental through United.com using codes “CDP 62455” and “PC 305023.” The codes should automatically populate if you click through to United.com from the email you receive. Rentals in Japan are excluded from the offer. With this deal, you’ll earn 500 United Airlines miles for being a member of United Airlines’ frequent flyer program, another 1,500 Airlines miles for booking a mid-size or larger car, and an extra 3,000 United Airlines miles with this targeted offer. Million Mile Secrets Team Member Meghan Was Targeted for the Deal! Plus, there’s no limit to the number of times you can earn the bonus miles! To earn the extra 3,000 United Airlines miles, your rental must be picked up by September 9, 2017. And too earn the 1,500 bonus United Airlines miles, you must pick-up your rental by September 30, 2017. There will also be a ~$1 daily surcharge for adding your United Airlines frequent flyer number to your reservation. It sure is! Especially if you have a car rental already planned, or if you can find a good price on a mid-size or larger vehicle. Because there is no minimum rental requirement to qualify for the bonus miles. As always, I suggest doing the math to see what makes sense for you. 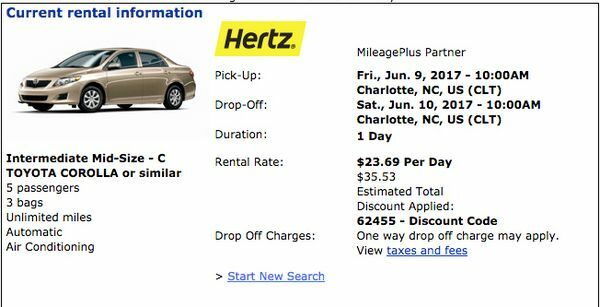 For example, I found a one-day rental in Charlotte, North Carolina in early June for ~$36. If You Can Find a Cheap One-Day Car Rental, This Deal Can Be Especially Lucrative! Paying ~$36 to earn 5,000 United Airlines miles is a good deal! Because, for example, that’s a fifth of the way towards a round-trip coach award flight within the US, which costs 25,000 United Airlines miles. Or halfway to a short-haul (700 miles or less) one-way coach flight on United Airlines or United Express, which costs 10,000 United Airlines miles. If you weren’t targeted or are looking for other ways to save on car rentals, check out this post about finding cheap car rentals. And this post about saving time & money on car rentals with Costco Travel. With this targeted offer from United Airlines and Hertz, you can earn up to 5,250 bonus United Airlines miles on Hertz car rentals. So check you email to see if you qualify! If you can find an inexpensive one-day rental, this deal could definitely be worth it. One-way short haul (700 miles or less) award flights on United Airlines and United Express cost 10,000 United Airlines miles. So this deal could earn you half the required miles in just one rental! I was targeted for the 5,000 miles offer and completed a rental, but only 2,000 miles have posted. I contacted Hertz and they said promo miles should post in 6 – 8 weeks. It makes no sense that a portion posted and the rest will post later? Should I contact UA to see what happened? Thanks! The bonus miles should post within 2-3 weeks, no longer. Was targeted for the offer. In the past, have been able to get weekend day rates of $11 – $15 that jump to the high $20’s with the IAH fees added in. Looked at several weekend days in June and the rates were in the $20’s and $30 before the IAH charges. All-in price for a day were in the $40s and $50s. Doesn’t make any sense at those prices, can buy gift cards for the same price with much less hassle. Bonus miles are awesome but the Hertz prices are not. I just did a search for an upcoming trip. Dollar is $155 for the week, Thrifty $164, Hertz…….$455. That’s quite the jump! Thanks. I only got the 2,000 offer, my husband got the other one. Hopefully we can make use of it.